Germany and the Netherlands have taken delivery of their first Boxer armoured personnel carriers. Rheinmetall Defence and Krauss-Maffei Wegmann (KMW) transferred the first serially produced Boxer to the Organisation Conjointe de Cooperation en matiere d’Armement (OCCAR), which is administering the Boxer project, and Germany‘s Federal Agency for Defence Technology and Procurement (BWB) at a ceremony in München last week. The transfer took place in the presence of German defence minister Dr. Franz-Josef Jung, and Dutch defence minister Eimert van Middelkoop. 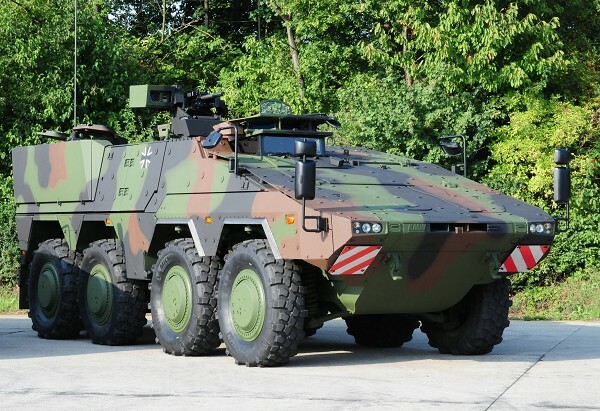 The series order for the Boxer includes a total of 272 vehicles for the German Bundeswehr and 200 for the Dutch armed forces. The Dutch Army will take delivery of the Boxer from 2011 through to the end of 2016. The manufacturers describe the Boxer armoured transport vehicle as a pioneering, highly mobile 8×8 wheeled vehicle that “thanks to its modular design, it can be quickly modified for a wide variety of missions, going from a medivac role, for instance, to a command and control configuration.